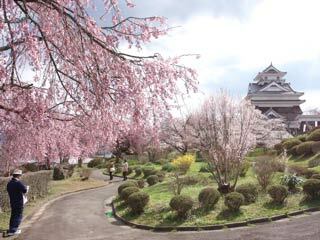 Tsukioka Park (月岡公園) is located right next to Kaminoyama Castle. It is popular Hanami spots around the area. There are about 100 sakura in This park. There is light-up Sakura during the season, and it has great view of Kaminoyama Castle with Sakura and entire area of Yamagata area. Light up: 18:30 to 22:00 around middle to the end of April. Isabella Bird, who is the famous traveler in 19th century, had visited this park in 1878. She was the first western travelers visited Tohoku Region during Edo Period. She wrote about this park and Kaminoyama town as one of the best spots in Japan. "The Onsen was excellent, the town was beautiful and clean, and the best fresh air in Japan."